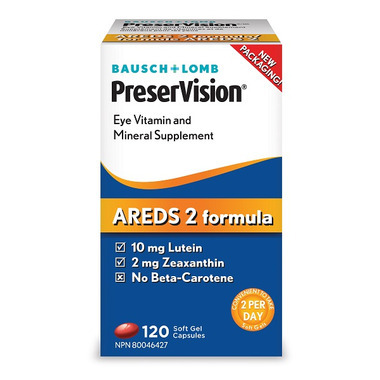 Bausch & Lomb PreserVision AREDS2 Formula helps to maintain eyesight in conditions associated with sunlight damage and age-related macular degeneration (AMD). Directions: Two soft gel capsules per day or as recommended by your health care practitioner. 1 in the morning, 1 in the evening with food. Take a few hours before or after taking other medications. Cautions: Consult a health care practitioner prior to use if you have cancer. Known Adverse Reaction: Zinc supplementation can cause copper deficiency. I started taking this about a month ago, and I'm seeing subtle changes to my sight. I usually have to get new glasses within less than two years, and I got the pair I'm wearing now in March of this year. As such, I'll have to wait until the ending of next year to really know if it truly helps or not, as, then I'll know if I'll have to get new glasses or not. I'll update this post then according to the result. I use PreserVision in the evening and Vitalux Advanced in the morning. My vision has not deteriorated since I started this regime 3 years ago. Best price around. Exactly what I wanted. Received in the time stated. I am happy. I've used Bausch & Lomb Preservision for several years and, although I have some macular degeneration, Preservision has stabilized the condition so there is no more deterioration. I take this supplement religiously and it's recommeded by my eye doctor. I use AREDS formula Preservision or Vitalux for a medical condition and appreciate the larger size of Preservision offered on your website and the very competitive pricing plus delivery right to my home.